We are working in some fronts now, one of them is using Math Classroom Challenge to develop new skills in the Virtual Reality and Augmented Reality worlds. With that experience we want to add new features to Math Combat Challenge. While we show an advanced video, we want to bring here a first testing video of Math Classroom Challenge AR version, testing the main characters of the game, still with no interaction. In a few days we’ll bring a more advanced video. Thanks for your support. We’ll inform about the release date of the new free Arena very soon. While we’re on it, we want to show some new features to this Arena. 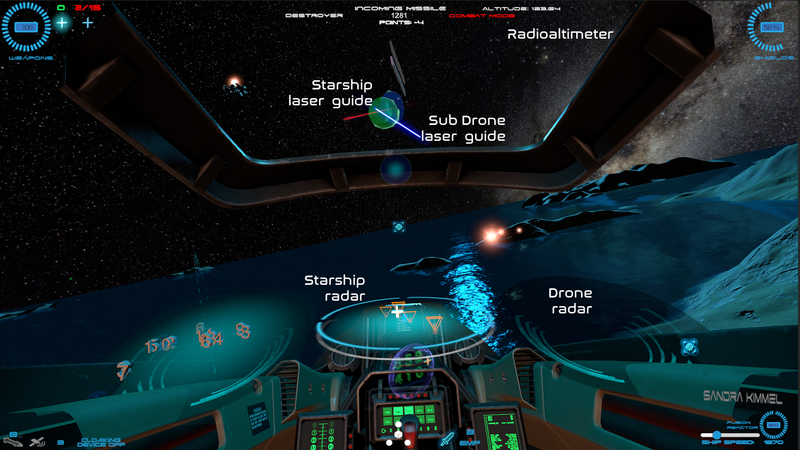 The HUD (Head UP Display) of the starship for the new free Arena of Math Combat Challenge includes new elements for air to air and air to surface combat, that are outlined in this image. While flying in atmospheric mode, the starship only will rise until a certain altitude, and crashing into the ground will be lethal. But you’ll have to point to the ground targets that can only be destroyed with lasers. But there will be more; you’ll also have to deal with submarine combat sometimes, because some key elements will be hidden at the bottom of the sea. We think and hope that these elements will be a new challenge for you. More info coming soon.